Useful links, click to open. Don't be fooled, get educated! 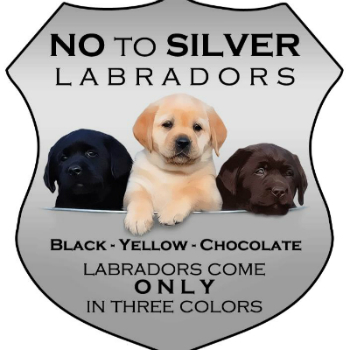 Read the link posted bellow and find out why so called "silver", "charcoal" and "champagne" Labrador Retrievers are actually not a purebred dogs. Learn more about the "D" (dilute) gene, and how it has appeared in "silvers". Find out why responsible breeders around the world breed Labrador Retrievers only in 3 recognized colors - black, yellow and chocolate. Don't pay for something which is not allowed in the Standard and not recognized by any Kennel Club around the globe. If you are fascinated by that specific silver coat color, you should look for getting a puppy of the breed Weimaraner. Try to understand the genetic and learn from where the "silver Labradors" are coming.